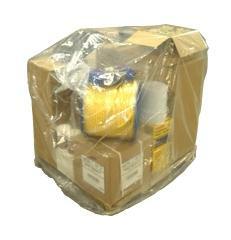 PRODUCT: Plastic Pallet Covers. Fits 4 x 4 x 4' Palletized Products. UV Resistant 2 Mil Thick CLEAR Plastic. Covers in a continuous roll with easy-tear-off perforations. 45 Covers/Roll. Price/Roll.